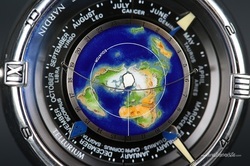 The Tellurium Watch Is A unique, limited-edition time telling device from Ulysse Nardin. The name Tellurium is from the Latin for Earth: tellus. The price? $118,000.00!!! "The time-telling device works in quite a strange and unusual fashion." - (Not the way globe-earthers are used to). "With a flexible spring bending from the Tropic of Cancer to the Tropic of Capricorn to reveal the part of the Earth lit by the Sun and to indicate the time and place of sunrise and sunset." Moreover, the moon rotates around the Earth in real time and the included dragon hand indicates the eclipses of the sun and the moon. This perpetual calendar completes one turn each year. The timepiece sports a platinum case, with a genuine enamel cloisonné dial. The Tellurium J. Kepler includes sapphire crystals and a very expensive (and good-looking) leather strap. Limited edition, only 99 units available. In this series, I will attempt to showcase a different logo and company in each post.